The mid-to-late Thirties is the high point of ARGOSY for me, with consistently good covers and great writers. But those serials! I guess it didn't matter much when you could go down to the newsstand and buy the new issue every week, but now they're the bane of a collector's existence. Lots of fantastic reading whenever you manage to put together all the installments of a serial, though. 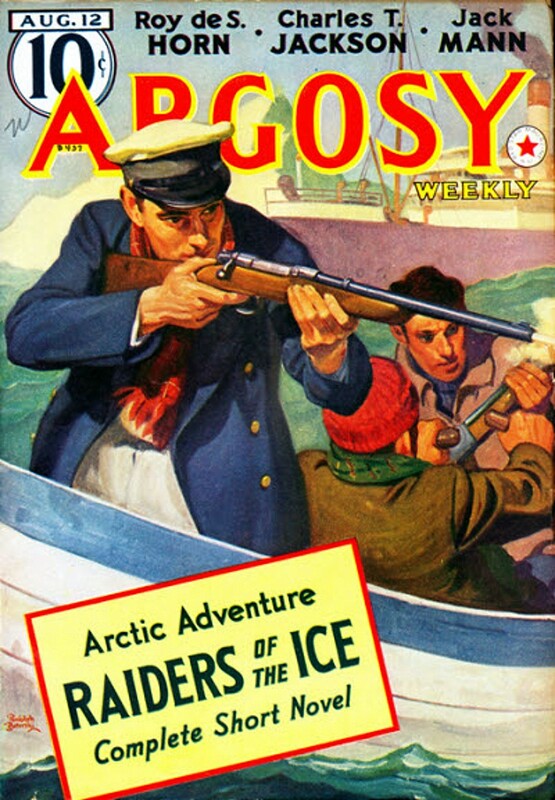 This particular issue has three serials running, all by popular authors: Theodore Roscoe (one of the best pulp writers), Jack Mann, and Charles Rice McDowell. The cover-featured novella is by Roy de S. Horn, an oddly bylined but excellent writer/editor. The cover is by Rudolph Belarski. Looks like another typically fine issue of ARGOSY from this era. Roy deS Horn Cmdr. Roy deSaussure Horn, USN (ret. ), 79, of 16 Revell St., Annapolis, died of pneumonia on Friday at the Naval Hospital in Annapolis. Born in Boston, Ga., he was a 1915 graduate of the Naval Academy. He served on cruisers, battleships, on the Presidential yacht Mayflower and the old frigate Constellation. He retired as a lieutenant in 1919. Cmdr. Horn began his literary career in 1919 as a magazine fiction story and article writer on both the Navy and American History. He returned to the Navy in 1939 as an instructor in English, history and government at the Naval Academy. Returning to inactive duty in 1946. he joined the Naval Institute staff as its first fall-time professional managing editor.